MODEL : AM - 4201. WITH DATA HOLD. 80 - 5910 ft / minute, 0.8 - 58.3 knots / hour. PRICE : INR Rs.3, 250/- Set. AIC-AM-4201. 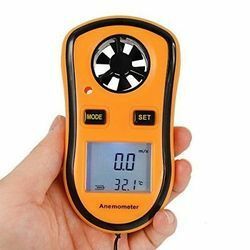 Anemometer (air velocity meter). Without temperature. Without Temperature. 0.4 to 25.0 M/S, M/S, FT/MIN, km/h, knots, Data hold, 18 mm LCD. Low-friction ball-bearing vane. 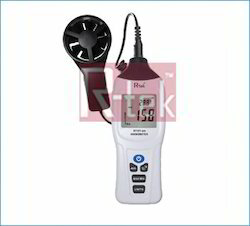 Our clients can avail from us wide range of Digital Anemometer, which is widely used for mapping wind speed. Functions : Vane velocity and airflow, temperature.